It's easy with SA-Venues.com. Our online travel guide gets you from A to B anywhere in South Africa. No fuss, no booking fees, simply deal directly with the venue. 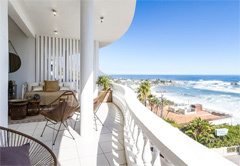 SA-Venues.com offers the choice of a huge variety of hotels and accommodation in South Africa. Find safaris and tours, and travel packages, for all budgets, all in one place. 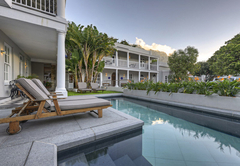 Whether you want luxury five star Cape Town hotels or an apartment in Pretoria, you'll find it here. 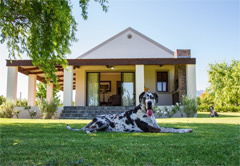 Our accommodation options include everything from small hotels in South Africa through game lodges, inns, guest houses, B&Bs to self catering accommodation, caravan parks, guest farms, houseboats, camping sites and bush escapes. You'll find we've included the secluded and less obvious options too, like environmentally friendly getaways, spas, and pet-friendly and child-friendly locations. 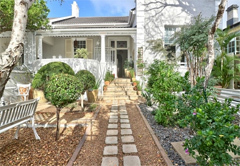 Whether you're travelling from Cape Town to Jeffreys Bay, up the Garden Route, from Durban to the Drakensberg Mountains, or from Johannesburg and Sandton to the Kruger National Park there are endless travel options. SAA (South African Airlines) and a series of low budget airlines fly to all the major centres. Once there connect with numerous tour providers, or self drive and go it alone. Simply use SA-Venues.com to plan your South African travel itinerary. To call South Africa 'beautiful' comes only close to describing the unequalled diversity enfolded in its vastness. From the sandswept, icy waters of the Cape West Coast to the sunbaked savannah of the Limpopo there are terrains too numerous to absorb in one visit - South Africa is the smörgåsbord of the African continent. Cape Town's iconic Table Mountain and Cape Point, Namakwaland's annual spring flower symphony, the epic peaks of the Drakensberg, the Kruger National Park's wildlife-filled plains, the shopping bonanza and heartbeat of Jo'burg's nightlife, the implausible scenic beauty of the Blyde River Canyon and God's Window in Mpumalanga, and the five ecosystems of the iSimangaliso Wetland Park on South Africa's Elephant Coast - there is magic in every corner of our country. Whether you are here to experience everything, or simply to explore the beaches, the mountains or the wine routes, there is seldom a traveller who has not found something on our shores at which to marvel. Whatever your choice, SA-Venues.com makes it easier to travel in South Africa. Lovely bush walks, great place for kids and pets, cozy cottage with fireplace and amazing views from the top! Perfect cottage in the mountains of the southern drakensberg. Wonderful relaxing family trip. Steve the owner is brilliant. The B&B very clean and neat, the hospitality is great, the owner Bruce is very friendly & helpful, every morning received a delicious breakfast. Will most certainly stay there again. Very comfy couch and bed, amazing big shower, nicely furnished, awesome location close to beach and city center, would highly recommend. Great stay ! Nice and private . This is a really good and safe place; the two families enjoyed our peaceful stay! Dareen ( the hostess/owner) is a good host !